Very few people these days worry about nuclear war destroying the world, Dr. Strangelove-style. And the US’ unending war in Afghanistan and America’s military actions around the globe seem part of the wallpaper—there in the background, but not affecting anyone in the homeland other than that very small number doing the fighting. However, if you drive by the heart of Ferndale at Nine Mile Road and Woodward, Mondays at 4:30-5:30 P.M., you’ll get a reminder of the ongoing conflicts and the persistent threat of nuclear destruction. Standing on the southwest corner, picket signs aloft, is a group that has brought their message of peace to passersby for the last 628 Mondays. Beginning in 2003, the loosely-organized peace advocates echo part of the Postal Service credo — “Neither snow nor rain. . .” – showing up undaunted by weather conditions or even by a dust-up with the Ferndale police in 2008. 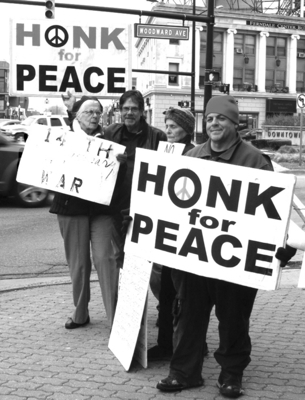 As they did back then, the most prominent signs say, “Honk for Peace,” which is met with an unending response as cars drive by. It was those signs and the horn-honking that got the group in trouble when the police decided that the cacophony of horns created a disturbance and made some arrests. Eventually, it was all settled amicably and peace was made on the corner although the signs and the response continue. How can you describe people who brave the elements and, at times, scorn for their Cassandra-like warnings? They would shy away from heroes. Maybe just “the Nine Mile Peace People,” as they’ve been called. But there are people who were strategically located at the center of nuclear decisions that saved the world, that maybe deserve a heroic depiction. One must be extended to an obscure Soviet duty officer, Col. Stanislav Petrov, who, when working at a Russian early warning station, on September 27, 1983, received signals that the US had launched ICBMs at his country. He had seconds to decide whether it was a satellite glitch or real and launch the Soviet arsenal in response. Fortunately, he made the correct decision (we had not launched missiles, and thus no cause to retaliate). Six weeks later, in the midst of US-NATO war games on Russia’s border, right after President Reagan had ramped up his anti-Soviet rhetoric and unveiled his Star Wars missile defense system that would have given the US nuclear superiority, another crisis unfolded. So, whew, right? Courageous men saved the world. But all of our lives were on a razor’s edge, any one of which could have gone the other way. Not good. And, what do we face today? Trump falsely denounces the US having “fallen behind on nuclear weapons capacity,” and commits his administration to achieving “nuclear superiority,” a policy which will result in a new arms race. Add that to his call for a$56 billion dollar increase in war spending, and the situation seems very frightening. But, the darling of the liberals, Barack Obama, proposed a $30 billion increase and a $1 trillion modernization of US nuclear forces. As with so many other issues facing us, it is increasingly upon us, we the people, to demand an end to war and the outrageous expenditures being spent in preparation for one. And, that is partly done every Monday in downtown Ferndale. Sometimes she has been out on the corner by herself. Don’t let that happen. See you on Nine Mile this Monday? Peace out.